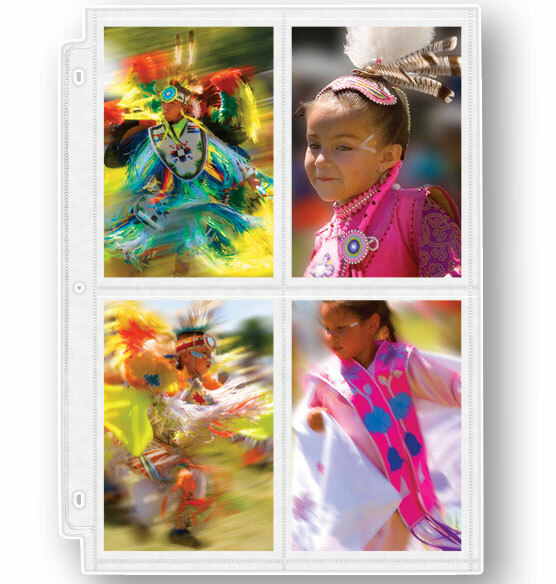 Exposures archival double weight 4-pocket pages for 3.5 x 5 photos are made of photo safe material which makes them the safest photo pocket pages available to protect your most precious photos. 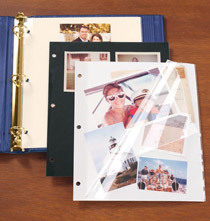 8 5/8" x 11 1/4"
i use this product to display "old photos"..the size is right, and my family loves to go down memory lane at our gatherings.....most of all i know they are protected by using this fine product. Double weight is more than worth the expense in the support and protection it gives antique photographs. 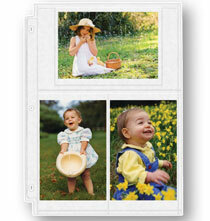 I have photos that require this size of album pages and Exposures is the only company that carries them. Simply, it is what I need. Still have the old size format photos. These are high quality and it's the 3.5 x 5 size is not as easy to find as it once was. Entering old post cards from the turn of the 20th century--too old to throw out. Putting into a binder. I chose these pocket pages because most of my prints are this size. I have enjoyed the photo supplies from this company. Trying to preserve some of my father's old photos. These are good quality archival storage pages and will do exactly what I need. I have several albums in which I have used these pages. I love the quality and weight of these photo pages. I have lots of photos the size. Slightly frustrated with all having to be in the same direction but it works out. I use a paper cut to the right size and journal when I don't have the right picture. Super clear, durable and easy to use. needed archival sleeves for old, irreplaceable family photos. All sizes. Great overall size for the older album we have. Nice weight and pictures slide in very nicely. It's the size my Mom was looking for. The size of these pockets works well with 1950s era photos. 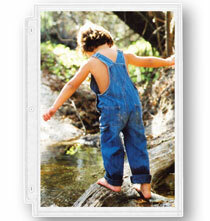 I am redoing pictures from old albums with the no longer sticky pages and putting them in new three ring binders. I have ordered in past and like these pages. Good quality, have used for years. I've occasionally had problems with these pages not being sealed completely at the bottom, but they were always promptly replaced. Have used this product many times in the past. Sometimes I have more vertical than horizontal pictures and this page takes 8. 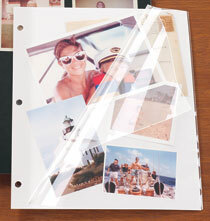 I mix it with pages that take horizontal pictures in the same album. don't use this size anymore. Only 4x6. Because single weight not available. I am finally putting all my photos that have been sitting in a drawer into albums! Because I didn't know which one to order. it is the right item for where I want to use it. 3.5x5 pages are hard to find. I was on line for a half hour before I found these. I needed specific sized archival photo pockets. I was unable to find these sizes unless i wanted to buy pages, with other sizes, that I did not need. Not at hobby lobby ,michaels or target. BEST ANSWER: They pages are clear. You can see through them from the front and the back. They are very good quality. They are clear on both sides - no paper in between. Super sturdy!! They are clear you could see your recipe cards from both sides. They're clear. You'll be able to see both sides just fine! Clear backing. It would work just fine for recipe cards. Which side do the photos load from? 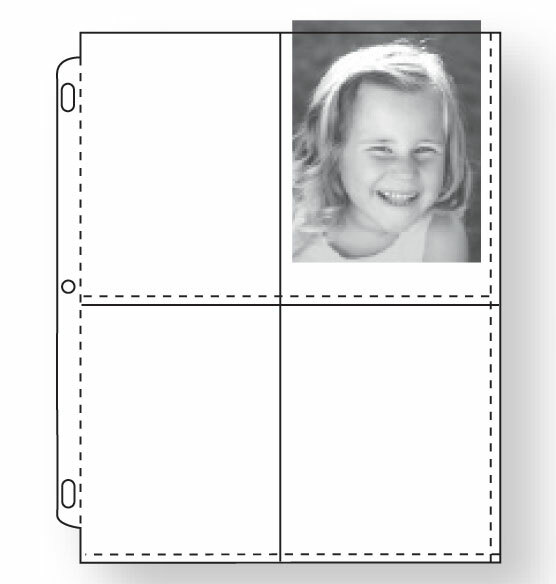 BEST ANSWER: If you're inserting vertical/portrait orientation photos, you would insert them in openings that face the top of the page. If you're inserting landscape/horizontal photos, the openings would be toward the right-hand side of the horizontal page. Thank you for your question. The photos are slid in from the top of the pockets. We hope this information will be of help to you. Photos load from the top, or the short dimension. Each pocket loads from the top. Are there any 3 x 5 pages that are all landscape orientations on the page? BEST ANSWER: Thank you for your question. We do carry one set of pages with the landscape, please click on the following link to see them, https://www.exposuresonline.com/buy-panoramic-oversize-album-pages-309389?w=3x5%20pages. We hope this information will be of help to you. Which 3 ring album fits these pages? BEST ANSWER: Thank you for your question. Any of the three ring albums will fit these pages. We hope this information will be of help to you. How do you attach the photographs? Double Weight 4-Pocket Pages For 3.5 x 5 Photos - Set Of 10, 3.5" x 5"
BEST ANSWER: You don't have to attach them, but simply slide them in the pockets. I use them to hold recipes, too!